IT’S YOUR LUCKY DAY, as the April edition of The Lit List is officially here to bless your screens. 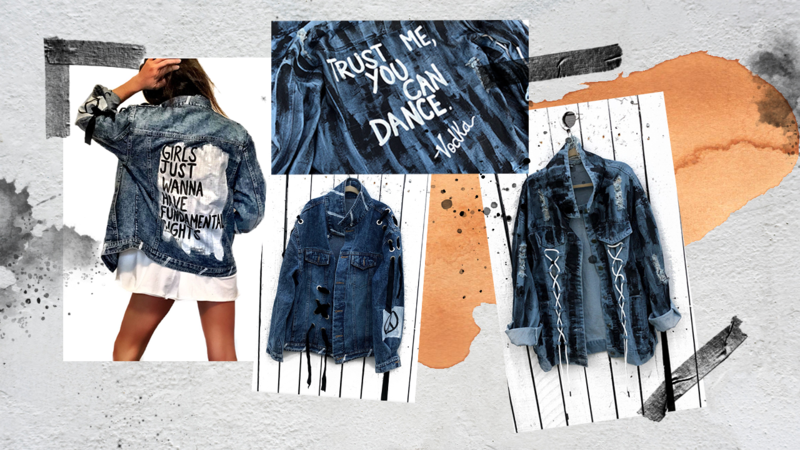 We are very excited to be showcasing our latest loves for April, and we KNOW you will be as obsessed with them as we’ve been. So, without anymore chit chat, let’s get started! Speaking of Gin… We obviously all promised 2018 was going to be the year of self-love round these parts, but then Pink Gin and Lemonade happened so that kinda got put on the back burner for a hot minute. But believe us (this time) when we say 2019 is THE year of self-love. What spurred this on you (didn’t) ask? We read a great new book that’s pushed us in the right direction. It’s called “Beyond Beautiful: A practical Guide to being happy, confident and you in a looks obsessed world”. That’s a mouthful. The book focuses on working from the inside out, trying to ignore what society tells us to be, and instead, being what we want to be. It’s a real feel good book, one we hope everyone can learn a little bit from! And in the spirit of self and self care and the start of Spring, we’re thinking that the best place to start is (of course) with our wardrobes. If you’re anything like us, the second it hits April, we go shed our winter wardrobe cocoon, and we spread our beautiful summer wardrobe wings. 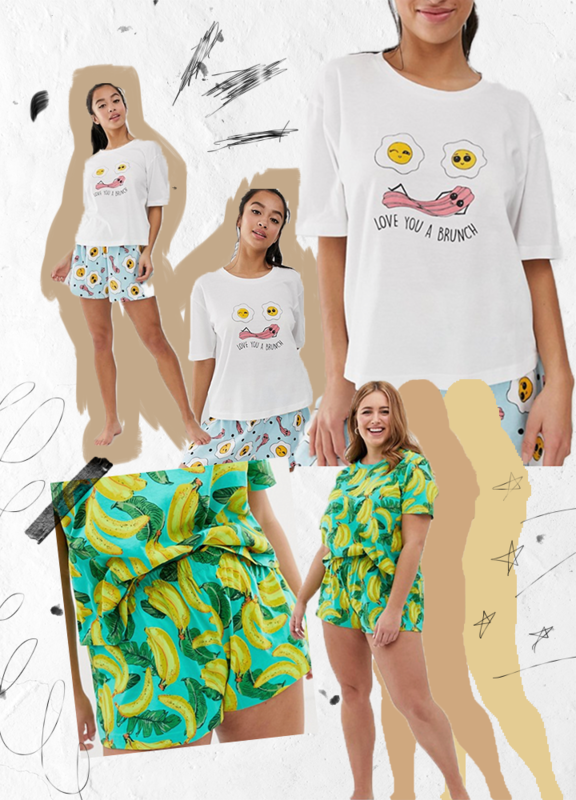 Which means one thing…spring cleaning our wardrobes, getting rid of all those grim old sweats you never wear anymore, story your old winter P.J’s but most importantly that means NEW PYJAMAS! ASOS are of course, winning. This month, we’re loving the “Love you a brunch” set and the “Banana” set (did someone say we’re hungry?). 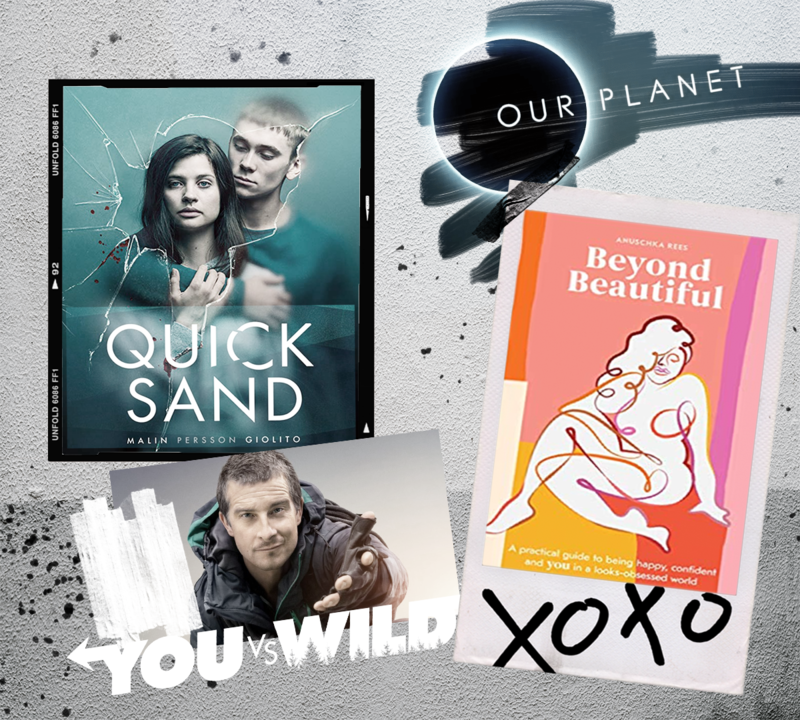 Whilst we’re in our pyjamas, chances are we’ve been binging Netflix this month, so here’s some new releases to satisfy your duvet days. After getting over the shock of “The Disappearance of Madeline McCann” (Suzie’s Edit: BABES I’VE BEEN FOLLOWING THE CASE SINCE I WAS 15… I AM NOT SHOCKED), the fictional drama “Quicksand” has been giving us real private investigator vibes. Unfortunately, 6 episodes just isn’t enough for us, so we’ll definitely be keeping an eye out for a second season on this one…what’s your deal Maja?! Bandersnatch was obviously well received by many of us, so Netflix has given us a fresh set of choices to sink our teeth into, with our favourite jungle man, Bear Grylls. “You vs Wild” lets us follow Bear around and make (potentially life threatening choices), great for those of us who wanna do some exploring, even better for those of us who maybe aren’t the biggest fan of Bear so wanna put him through his paces a bit (sorry babes x). Sunday morning hangovers have never been better, David Attenborough’s series of “Our Planet” is a new opportunity to cry over Polar Bear cubs, as well as highlighting the impact of climate change… a must watch! And finally, the one we’ve all been waiting for… The Chilling Adventures of Sabrina is back and we’ve never been more happy to spend a Saturday night in binge watching and shipping Nick and Sabrina. 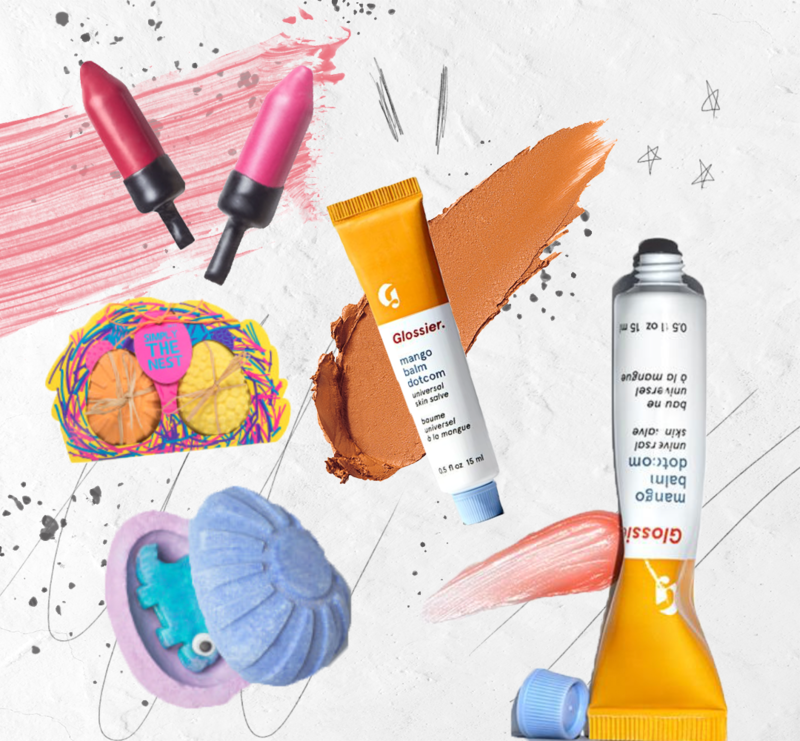 Moving over to the beauty world… if you’re wanting more love for your lips, Glossier most certainly know how to keep us happy. Just when we thought we were satisfied with the ‘balm dotcom’ range, they added Mango to the collection. It was the balm we didn’t know we needed until we were blessed with it. Remember girls, if he ain’t treat you right…let that Mango ;). Lush have always been great for cruelty free beauty products and glittery bath bombs (for real, that glitter gets f**king everywhere), and now they’ve pulled it out the bag AGAIN, this time with their Lipstick Refills. Basically, the replacement product comes in a wax case that you discard (a bit like a Babybel), and then you just pop the product back into its original tube without wasting all the plastic packaging every time you need a new lipstick. (This part is less like a Babybel). It’s amazing! They’re also selling some adorable Easter treats, our personal favourites being “Simply the Nest” and “Stegosaurus Fun Egg” …it looks a lot better than it sounds. Speaking of glossy(ier), whilst doing one of our very very very frequent Instagram browses, we came across a new account that we absolutely love. 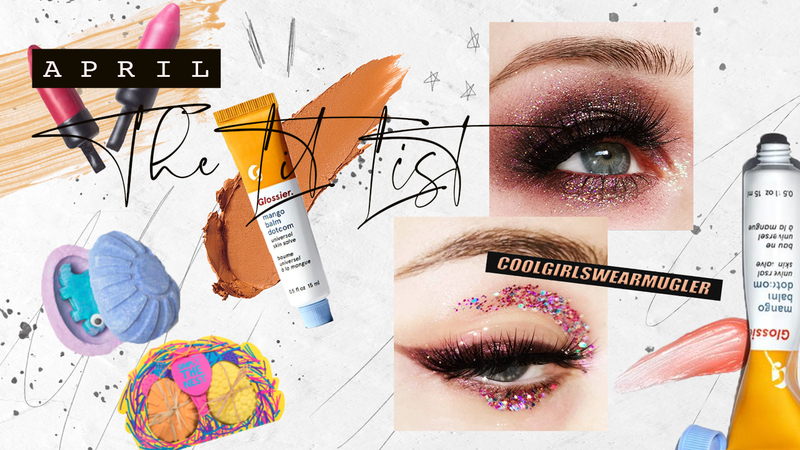 @Coolgirlswearmugler isn’t your ordinary makeup Instagram account, as it focuses on glossy, “kitschy” eyelids that are giving us LIFE. Whether you’re wanting a subtle look, or tinsel stuck to your eyelashes, you’ll definitely need a bit of Regina on your feed. In case you have actually left the house this April, there’s some lovely new music that’s been blessing our headphones. Khalid has released his new album “Free Spirit”; and we don’t know about you guys, but “Suncity” was actually on repeat for us when it came out last year, so hearing his new album was dropping in April was music to my ears (literally, lol). “My Bad” was released at the end of March, and I’m sure we can all relate to the songs message of forgetting to reply to a text and then someone getting lairy at us…soz hun. His contemporary RnB is most definitely giving us Spring sunset vibes. And last but not least, it obviously just wouldn’t be a Lit List post without a mention of our Queen Ari and of coooourse this month is no exception! The Sweetener World Tour kicked off in March and it’s been giving us some serious FOMO ever since. We are also expecting her to turn it OUT at Coachella this month, and no doubt Suze will be in the front row, belting out “break up with your girlfrieeeennnnnnd” and doubling as blonde Ari’s 2018 Sweetner era twin. Ari’s merch stand isn’t the only thing attracting a lot of attention before the show, as she’s also collabed with HeadCount to provide a stand where her fans can register to vote in the 2020 elections. They also get a cute sticker that says, “thank u, next gen”. Comment down below what you’re loving so far in April! Super cute edit! Omg, those jean jackts are absolutely amazing, I have to look into that brand!